With the abundant amount of school missed due to snow days and other weather-related disruptions, the school district decided to add an additional 25 minutes onto the end of each school day. As you can imagine, the reactions are mixed. 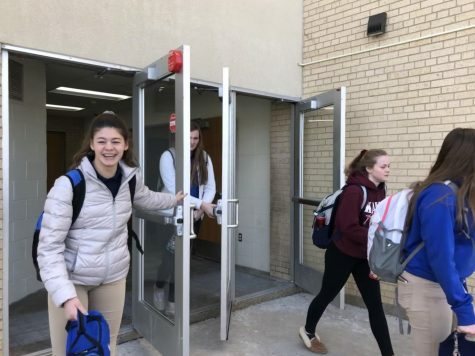 Gabby Moran, ’21, walking out of school later than she hoped. The extra 25 minutes has altered everyone’s schedule in some way. “I think the 25 extra minutes is a good way to make up time. I’d rather have additional time added than go further into the summer,” Maria Kircher, ‘20, said. Many teachers are trying to find extra time to get in all of their lessons before the end of the year, especially AP teachers because the AP test dates won’t be adjusted for snow days. “As an AP teacher, adding the 25 minutes into seminar would have allowed me to prepare my students for the test,” Mrs. Elizabeth Brace said. The new personalized learning program stresses the importance of Self-Directed Learning, (SDL). SDL is time given to students to learn new concepts and take content assessments, but it is only given during seminar and class periods on Fridays. “Because of all the delays and early outs we’ve had students have missed a lot of seminars and many students are behind. Adding the extra time into the seminar would allow us to have more SDL time and get back on track,” said Hishikawa, who is a personalized learning student. “I don’t think adding six minutes will make a difference in how much we will get done in each class period,” Kircher added. Although six minutes may not seem like a lot of time, Mrs. Brace plans to use the extra time as much as possible. “I plan on using this six minutes to do a multiple choice question with my class every day, although I could have done more if the time was added to seminar,” said Mrs. Brace.